Learning how to curate content is an essential task for social media managers. And time is short! Knowing what to share is the first step in making sure your content is on point. The key aspects of your brand’s content creation should naturally extend to other content that you share to build your content platform. Your curated content and your originally created content should have the same tone, big ideas and overall fit. Your content platform’s output of original posts, curated content, graphics, Tweets and comments all flow together into what the public sees and judges you on. Yes, it’s important! I like to call this target the “brand seeds.” Find the three seeds that make up the heart of your social content, and stick to them. For example, if I were working with Sprout Social, my three seeds might be social media, social media management and social customer service. I would find content that fit these three seeds and add in other content that was related and would be of interest to my followers. Sticking to a narrow focus helps build your area of expertise and knowledge base. Creating systems for your social media consumption is important. If you don’t have something in place for reading content and finding great content, you’ll waste a lot of time. I like to use Feedly to create folders for the different types of content I create. For each folder, I add RSS feeds to fill the needs of different accounts and sometimes clients. Feedly: Add RSS feeds into folders for different accounts or topics. Alltop: Create a MyAlltop page to see the blogs that I pull in to review when I curate from this platform. These are some of my go-to sources. Pinterest: This never lets me down for great content when I search. 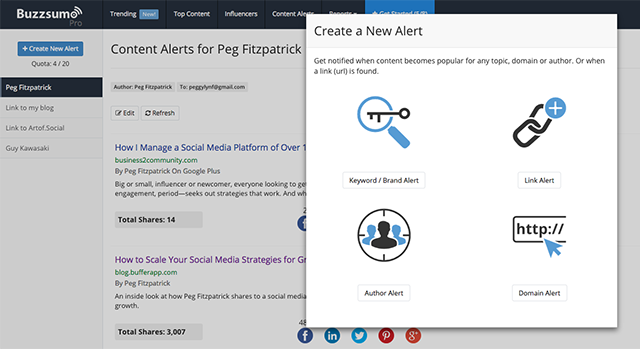 BuzzSumo: You can customize alerts in BuzzSumo by keyword, link, author and domain. I get an email for these each morning and check through on the website occasionally. Planoly: You can find great user generated content by hashtags or keywords. This is perfect for brands or if you’re using a branded hashtag for social media campaigns. A rookie mistake is sharing all your content at once in a huge bunch and then going long stretches without anything else. Don’t do this. Instead, create a steady stream of content that people won’t be overwhelmed with when they are live on social media. Set up your Queue to meet your needs. Mine is set to publish four times a day so that I don’t have to think about an exact schedule. This makes it easy to add posts with one click to the Queue. Use the Compose box to precisely schedule posts at a certain time. Use the Chrome extension to add to your Queue or schedule at a certain time. Sometimes you hit a sweet spot with your content, and everyone loves it! Then the algorithms change. Again. If your former best type of content is falling flat, it’s time to remove it from the repertoire. Use your metrics to see what’s working, and do more of that. This is common-sense advice that people fail to implement every day. In one of my most difficult-to-manage social media communities (read: low-tech industry with many lurkers), I asked what type of content they liked best and wanted to see on the Facebook Page. It was great to get feedback that reinforced what I was already doing and gave me some ideas for future content. Now I feel more confident that I’m sharing the content they love, and my Page is doing better than ever. I think many communities want to dictate what they want to share, when the goal should be to give people what they want. I keep my RSS feeds in Sprout and Feedly full of great blogs to read, but if I find myself skipping over blog articles in my feeds, I reassess whether I want to have them in my daily content to skim and read. Cutting them out here means more efficient curating later. Be there when you share your content. You are the X factor in your social media content curation. Managing the brand online with comments, questions and conversation is what ultimately draws people to your content over and over again. The best-laid social media strategy in the world will fail without people to manage the social media listening and interaction. I hope these pro tips give you some ideas to tweak your content strategy and create a compelling plan for your future social media marketing efforts. Time is short and content is a king to get success. You have explained very well to curate content. I would like to know your views about “Scoop.it” content curation website portal. I used Scoop.it in the past but it does essentially the same thing as Pinterest which I love. The bookmarking sites like Scoop.it, Reddit etc are great for finding content. I just narrowed it down to the ones where I found the best content. What do you like about Scoop.it? Really great tips about content thanks pegfitz ….. Thanks for reading and commenting! Where do you like to find your content? Great tips on how to curate content in less time Peg! I also love using Pinterest and Reddit. These sites are great source of fresh and juicy contents that are relevant to my niche.